A lightweight dress, crossbody bag and a pair of fab sandals are always a trio that I wear more often than not during the warmer months, definitely my summer uniform. Shoes are always one of my favorite elements to an outfit and I’m obsessed with any kind of shoe whether a flat, wedge or pump that has an ankle strap. I love the edgy yet sophisticated feel to these Sole Society sandals, a pair I’ll be sporting a lot this season, totally a summer sandal staple! Thanks for reading! Beautiful outfit! You did great mixing two bright colours and then toning them down with black sandals and shades! Amaze look. Love a loose fitted dress like this! Great color combo and love that little bag. Wow that viibrant blue dress looks so stunning! I have a bag that color from Target and I have YET to wear it…thanks for the inspiration! You look amazing!! Love this dress perfect for the Utah heat! breezy dresses are definitely my summer uniform too! LOVE that Otte dress paired with the gorgeous bag! Great colors!! Love the whole florescent look of this outfit!! That bag is to die for! You look absolutely GORGEOUS in these photos!! Love this comfy, bright look on you! 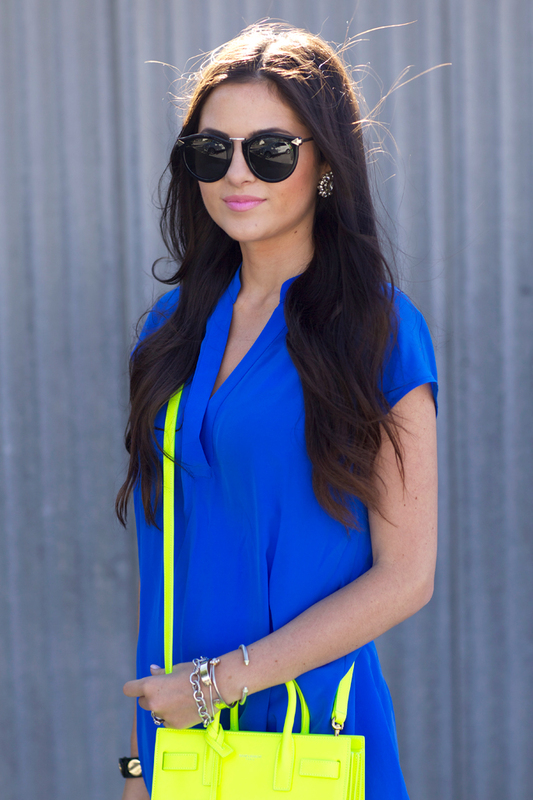 I’m such a fan of cobalt & neon paired together… it’s such a summery match! it is my uniform too! summer is the perfect time for dresses! i love the color of that blue dress! Hi Rachel, who makes the earrings you’re wearing in this post? Cute sandals & I love the dress! Light and airy! Nothing is more attractive in the summertime than airy dresses! I love this look! That dress is gorgeous and the color looks so good on you! I love the bold pops of color! That blue dress is so versatile and looks super comfy! love how light and airy this dress is! it really is perfect for these warm and sometimes stifling months! and those sandals are gorgeous! The bright blue and yellow just match perfectly in this outfit. Great job! That dress also looks super comfy, just perfect for summer! i think i need that dress!! The color of the dress is gorgeous. This dress style could be a staple piece for anybody’s summer wardrobe. I love this color combo! That dress is beautiful! Love the bright colors for summer!! I love the sharpness between the two colors….so stunning! 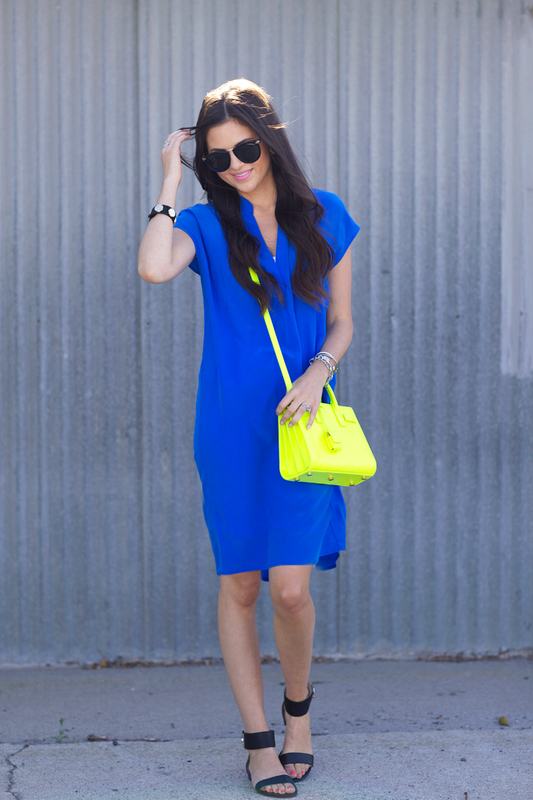 I love the color of your dress, it looks great with the pop of neon yellow from your bag. Love that pretty blue dress! Those shoe are perfection for summer! So versatile for work and casual outfits. Love it! Love your style, this outfit look gorgeous ! Blue is so your color! Love the relaxed fit of the dress, too! I ove this dress rach! Definitely agree with a lightweight dress being a summer uniform!! Love the neon against the cobalt! Perfect color of the summer dress. Love it. I love the simplicity of this look! I freaking love that bag! LOVE that you are rocking the cobalt and neon so much. Such a great look! You are so gorgeous! I love your summer uniform! The colors pop perfectly and those shoes look so cute and comfortable. Not to mention your hair is amazing! Could you do a post on some of the products you use in your hair and your hair care routine? You may have done this in the past, but if so I can’t find it ha! Thanks for being such an amazing fashion inspiration to me! I am just getting into fashion blogging, and I’m so excited! 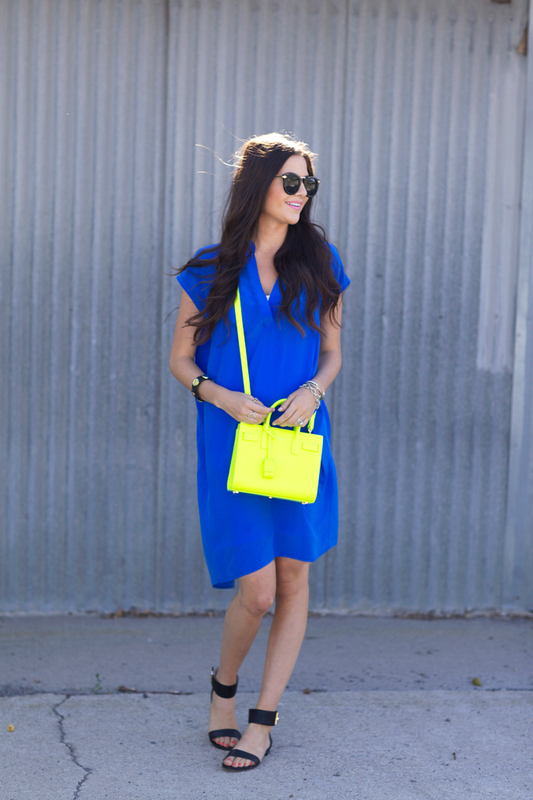 I love this shade of blue…it looks fabulous paired with the neon yellow! That dress is a gorgeous color and I love the sandals with it! The dress is stunning, I love the colour and the pop of neon. great shift dress, love the colour! Gorgeous once again! I will forever be obsessed with that neon bag! These 2 colors make such a cool combination! I love the colors in this outfit. That Blue just makes that yellow absolutely pop. I’ve never bought anything from Sole Society before but I’m definitely going to have to check them out. Those sandals are so cute! I agree, light cobalt blue dresses really are the uniform of the summer. This is the perfect summer outfit!! 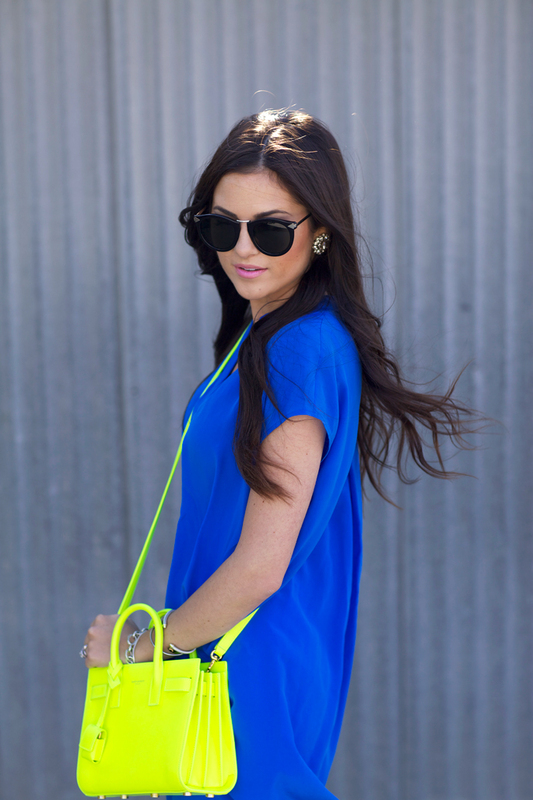 The neon bag is the perfect summer accessory! Love it as always! Wow! I love everything about this dress- the colour, length, and drape. It is perfect for hot summer days. I can’t get enough of cobalt & neon yellow. Such a vibrant mix. And love those sandals! I can imagine they would be a great investment for the summer to be worn with so many different looks! Love your choice of jewelry, too!! Great dress! Loving you Saint Laurent bag! Love the post Rach! Love this look!!! The colors are so bright and pretty! The bag is everything! It makes the blue really pop! You look great! I am in love with that Saint Laurent bag <3 Very cute! The color of the bag with the blue dress is such a beautiful combo. And those sandals! So fab!! What a gorgeous blue dress. Amazing color. I love the pop of yellow with the cobalt blue dress! Too cute! Very cute sandals. Loving the colour of your dress!!!!! Such a pretty dress! Love it on you! Love the simplicity of this shirt dress! so effortlessly chic! cobalt suits you well! In love with this bright mix of yellow and blue!!! My blue heaven! What amazing colors! Beautiful dress! Love the casual look and feel!